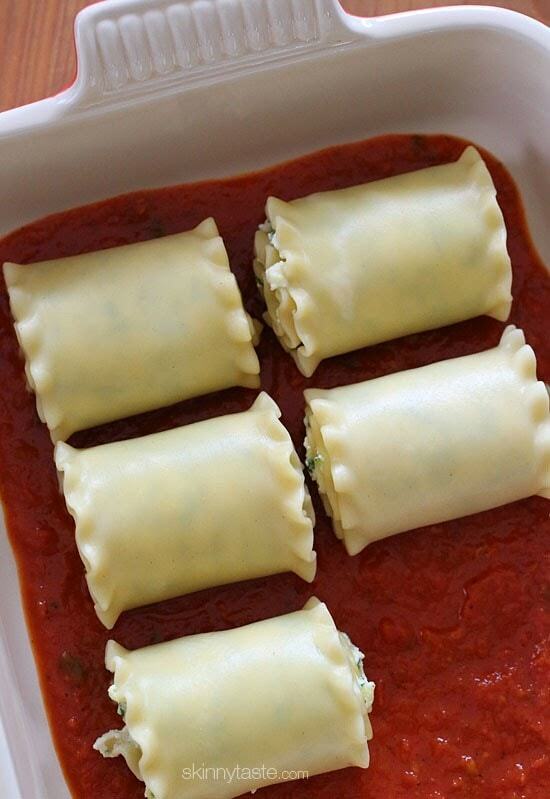 These EASY three cheese lasagna roll ups are stuffed with zucchini, ricotta and Parmesan, then topped with marinara and mozzarella cheese – delicious, kid friendly and perfect if you want to feed a crowd. 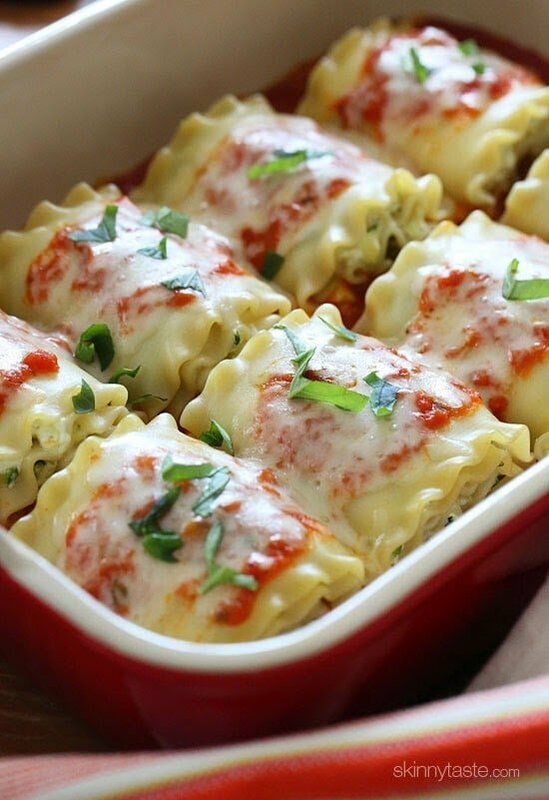 Individual meatless lasagnas filled with zucchini and cheese are easier than making a full tray of lasagna and they perfect for portion control. 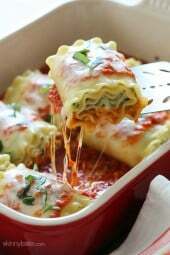 Similar to these Spinach Lasagna Rolls, only with zucchini instead. By now I’m sure you figured out I LOVE zucchini! I just shared a roundup of 35 Skinny Zucchini Recipes, so here’s number 36! 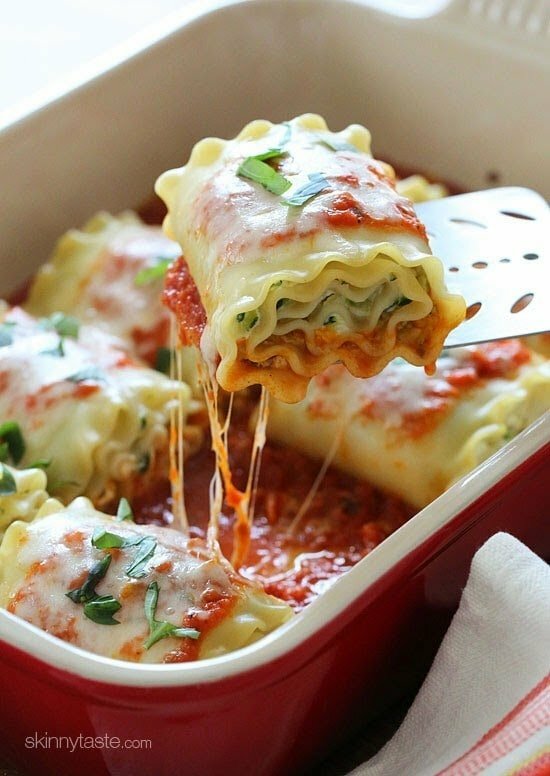 I’ve been craving lasagna rolls lately which I love making instead of traditional lasagna, they are so much easier to make and they’re great for portion control. My girlfriend brought me zucchini from her garden so I thought I’d try out this zucchini version instead of my usual spinach filling. These turned out SO good, and now I have yet another way to eat zucchini. To freeze, you can choose to individually freeze them in ziplock bags or freeze them as a finished dish ready for the oven. You can also freeze anything you’ve baked that you can’t finish. 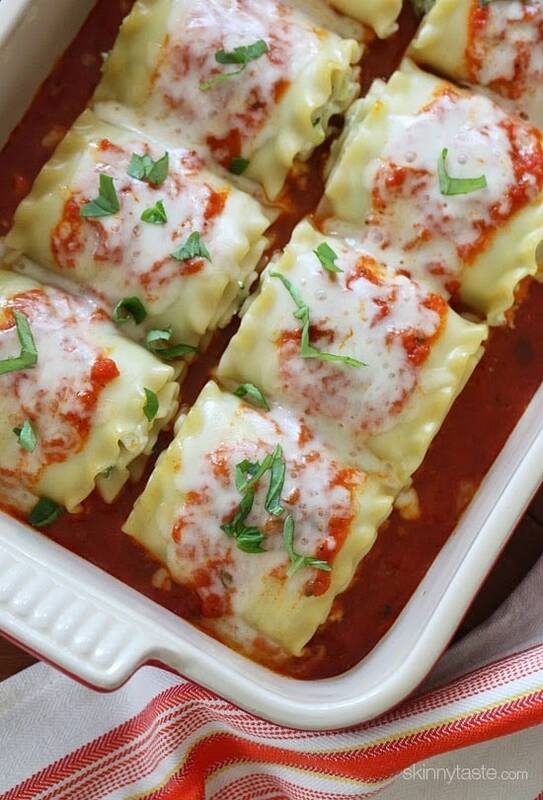 Click here for more details on how to freeze lasagna rolls. 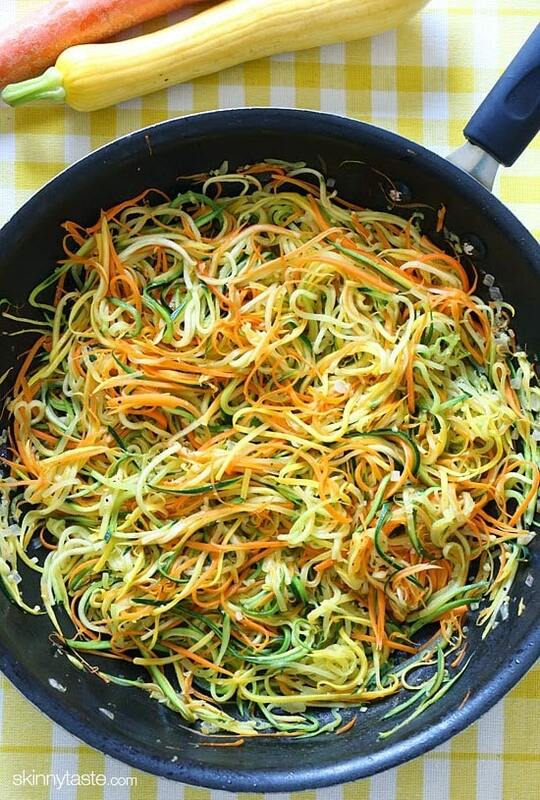 I served these with sauteed summer julienned vegetables on the side (I used my spiralizer) and it was the perfect meal! 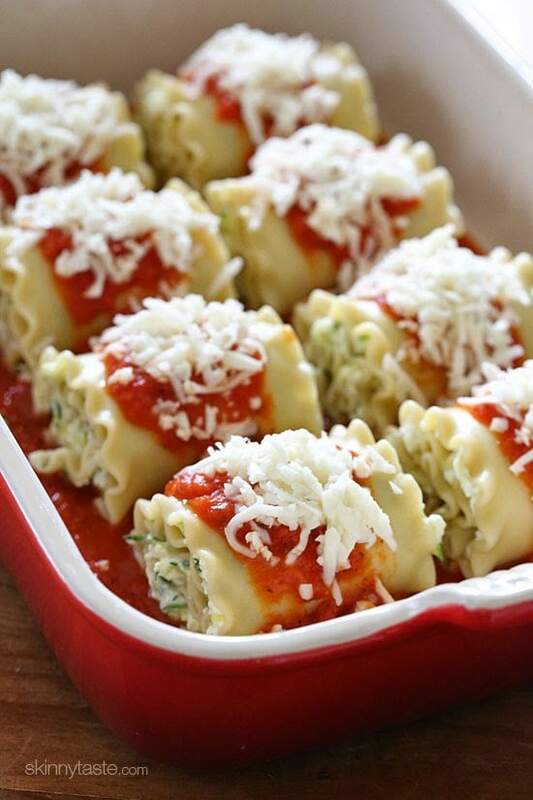 These EASY lasagna rolls are stuffed with zucchini, ricotta and Parmesan, then topped with marinara and mozzarella cheese – delicious, kid friendly and perfect if you want to feed a crowd. Preheat the oven to 350°F. Ladle about 1 cup sauce on the bottom of a 9 x 13-inch baking dish. In a medium nonstick skillet, sauté garlic and olive oil over medium heat for about 1 minute; add zucchini, salt and pepper to taste and cook about 4-5 minutes, until soft. 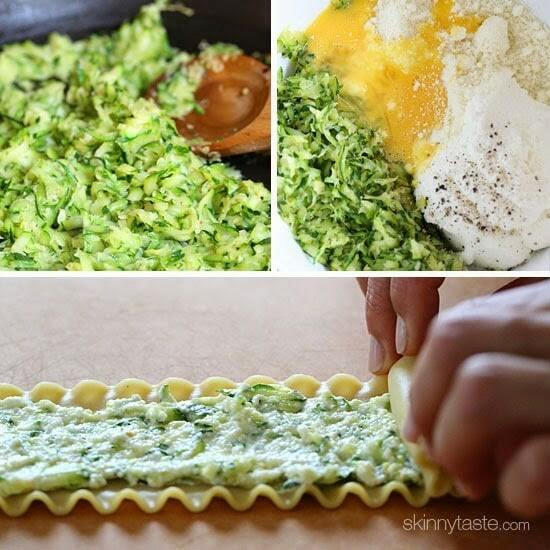 In a medium bowl, combine the zucchini, ricotta cheese, Parmesan cheese, egg, salt and pepper in a medium bowl. Lay out the lasagna noodles on a clean work surface. Make sure noodles are dry. Take 1/3 cup of ricotta mixture and spread evenly over the noodle. Roll carefully and place seam side down onto the prepared baking dish. Repeat with remaining noodles. Put foil over baking dish and bake for about 40 minutes, or until the inside is heated through and the cheese is melted. Top with fresh basil if desired and eat hot.